Ensure they eat any treat during a short period of time (to reduce the exposure to their teeth). Encourage them to rinse with water immediately after they consume any sugary or starchy treat. Limit sticky and hard candies, especially for those with braces. Ensure they brush and floss at least twice daily. Wait until a day or two before Halloween to purchase any candy. If it's not in the house, you won't eat it. Stay away from the candies you bought for Trick or Treaters. If you need a treat, reward yourself with something responsible and more health conscious (a piece of imported dark chocolate often hits the spot). 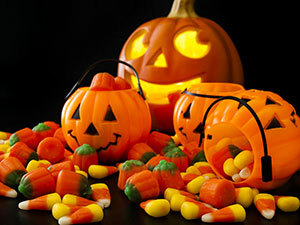 Take any leftover candies to your office in the morning so they are not around your home to tempt you. If you have to drive, please take extra care for trick-o-treators on the street. We encourage you to dress up, remember to have fun... and oh yeah... Happy Halloween!